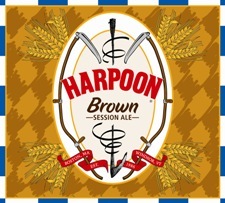 "Harpoon Brown is brewed to accentuate the sweeter, rounder notes derived from six different malts, including a de-husked chocolate malt that adds a hint of chocolate. The blend of these malts produces a beer that is complex and delicious without being heavy. This drinkable beer is perfect as a session beer or paired with foods. It pours a dark amber color, and the word chestnut, provided by Harpoon, seems appropriate. It has an off-white, fizzy head, that quickly dissipates. Fair lacing clings to our new, freezing cold brown ale glass. First aroma is of faint light bread malts, and not much else. Gentle on the nose. Initial taste is a very light bitter, which softens even more as it moves towards the finish. Light on the palate, it has a watery texture with a clean finish. A very drinkable, smooth taste that certainly lends itself to the session style. Reviewed on March 8th, 2007.